Horticulture was a very significant component of the economy of Middlesex from at least the 17th century and into the 20th. Most local histories remark upon the substantial amount of market gardening which supported London’s growing population at this period but say little of the nursery gardeners. While both forms of gardening were practised in the area from the 17th century, the nursery gardens evolved to meet changing markets and some became market gardens in their turn in the Victorian period. 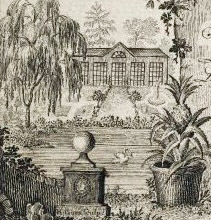 Garden historians have tended to concentrate on garden design, mentioning only a few of the major nurseries. The remarkable work of John H Harvey, in Early Gardening Catalogues (1972) and Early Nurserymen (1974), is the exception that proves the rule. This Nursery Gardeners Archive is designed to give the gardeners back a significant place in the history of the area, especially in the parishes along the Thames. It combines business history, family history and local history in its short essays. In them I make use of a variety of historical sources, including wills, letters, maps and records of property transactions to place the gardeners and their families in local communities. My initial work has concentrated on the Thames-side parishes, especially Chiswick and Brentford which I know best.